Humans die at an increasing rate until late in life, when mortality rates level off. The causes of the late-life mortality plateau have been debated extensively over the past few years. Here, I examine mortality patterns separately for each of the leading causes of death. The different causes of death show distinct mortality patterns, providing some clues about the varying acceleration of mortality at different ages. I examine mortality patterns by first plotting the data of mortality rate versus age on a log-log scale. The slope of the age-specific mortality rate at each age is the age-specific acceleration of mortality. About one-half of total deaths have causes with similar shapes for the age-specific acceleration of mortality: a steady rise in acceleration from midlife until a well-defined peak at 80 years, followed by a nearly linear decline in acceleration. This first group of causes includes heart disease, cerebrovascular disease, and accidental deaths. A second group, accounting for about one-third of all deaths, follows a different pattern of age-specific acceleration. These diseases show an approximately linear rise in acceleration to a peak at 35–45 years of age, followed by a steep and steady decline in acceleration for the remainder of life. This second group includes cancer, chronic respiratory diseases, and liver disease. I develop a multistage model of disease progression to explain the observed patterns of mortality acceleration. A multistage model of disease progression can explain both the early-life increase and late-life decrease in mortality acceleration. An early-life rise in acceleration may be caused by increasing rates of transition between stages as individuals grow older. The late-life decline in acceleration may be caused by progression through earlier stages, leaving only a few stages remaining for older individuals. Humans die at an increasing rate until late in life, when mortality rates level off. The causes of the late-life mortality plateau have been debated extensively over the past few years [1–6]. Here, I examine mortality patterns separately for each of the leading causes of death. The different causes of death show distinct mortality patterns, providing some clues about the varying acceleration of mortality at different ages [2, 7]. For most causes of death, the acceleration in mortality rises until middle or late life, and then declines rapidly at older ages. I interpret these patterns in light of a multistage theory of aging, developed by analogy with multistage models of cancer progression [8–11]. In the multistage model, disease develops by progression through a series of intermediate physiological or somatic conditions. I show that the late-life decline in acceleration (mortality plateau) is an inevitable consequence of multistage disease progression . The midlife rise in acceleration may also be explained by a multistage theory if the rates of progression between stages rise slowly during midlife . Figure 1 illustrates mortality patterns for non-Hispanic white females in the United States for the years 1999 and 2000. The top row of panels shows the age-specific death rate per 100,000 individuals on a log-log scale. The columns plot all causes of death, death by heart disease, and death by cancer. Age-specific female mortality patterns. Data averaged for the years 1999 and 2000 for non-Hispanic white females in the United States from statistics distributed by the National Center for Health Statistics , Worktable Orig291. The top row of panels shows the age-specific death rate per 100,000 individuals on a log-log scale. The columns plot all causes of death, death by heart disease, and death by cancer. The second row of panels shows the same data, but plots the age-specific acceleration of death instead of the age-specific rate of death. Acceleration is the derivative (slope) of the rate curves in the top row. The bottom row takes the plots in the row above, transforms the age axis to a linear scale to spread the ages more evenly, and applies a mild smoothing algorithm that retains the same shape but smooths the jagged curves. The curves for death rate in the top row have different shapes. However, the quantitative characteristics of death rate at different ages can be difficult to discern visually. The second row of panels shows the same data, but plots the age-specific acceleration of death instead of the age-specific rate of death (see Methods). The acceleration is simply the slope of the rate curve in the top panel at each age. 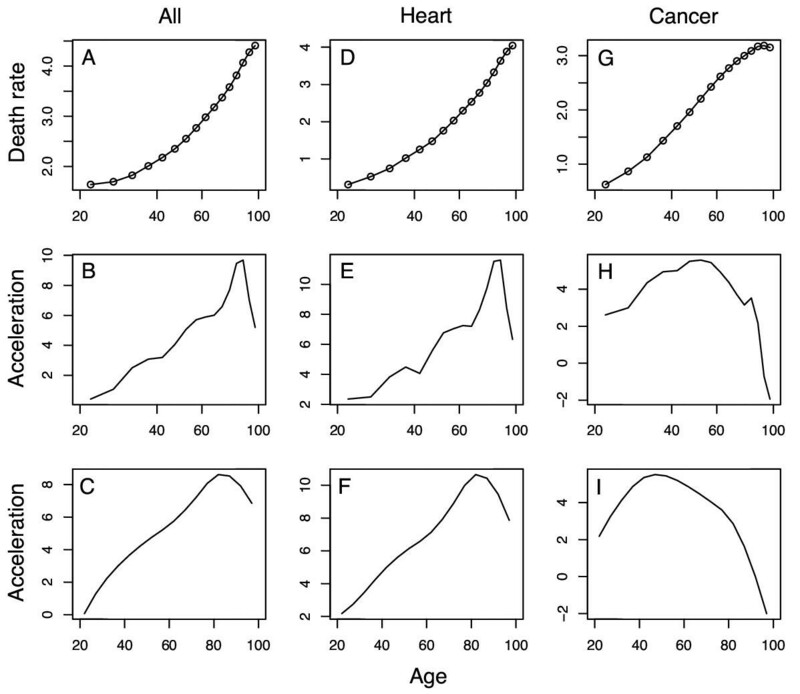 Plots of acceleration emphasize how changes in the rate of mortality vary with age. The bottom row of panels shows one final plotting transformation to aid in visual inspection of mortality patterns. The bottom row takes the plots in the row above, transforms the age axis to a linear scale to spread the ages more evenly, and applies a mild smoothing algorithm that retains the same shape but smooths the jagged curves. These methods of plotting transformations in Figure 1 are used to plot mortality patterns for the leading causes of death in Figure 2, using the style of plot in the bottom row of Figure 1. Age-specific male mortality patterns. Data averaged for the years 1999 and 2000 for non-Hispanic white males in the United States from statistics distributed by the National Center for Health Statistics , Worktable Orig291. The causes of mortality are based on the International Classification of Diseases, Tenth Revision . Heart, diseases of the heart; CerVas, cerebrovascular diseases; Accid, accidents (unintentional injuries); Infl, influenza and pneumonia; Suic, intentional self-harm (suicide); Nephr, nephritis, nephrotic syndrome and nephrosis; Sept, septicemia; Canc, malignant neoplasms; ChrRsp, chronic lower respiratory diseases; Liver, chronic liver diseases and cirrhosis; Diab, diabetes mellitus; Alzh, Alzheimer's disease. Figure 2 illustrates the mortality patterns for non-Hispanic white males in the United States for the years 1999 and 2000. Each plot shows a different cause of death and the percentage of deaths associated with that cause. The left column of panels shows causes that account for about one-half of all deaths. Each of those causes shares two attributes of age-specific acceleration. From early life until about age 80, the acceleration in mortality increases in an approximately linear way. After age 80, acceleration declines sharply and linearly for the remainder of life. Some of the causes of death also have a lower peak between 30 and 40 years. The upper-right column of panels shows causes that account for about one-third of all deaths. These causes show steep, linear rises in mortality acceleration up to 40–50 years, and then steep, nearly linear declines in acceleration for the remainder of life. The bottom-right column of panels shows two minor causes of mortality that are intermediate between the left and upper-right columns. What can we conclude from these mortality curves? The patterns by themselves do not reveal the underlying processes. However, the patterns do constrain the possible explanations for changes in age-specific mortality and suggest some interesting hypotheses. With regard to constraint, we can rule out a single underlying cause of all human mortality acceleration because the two leading causes of death, heart disease and cancer, show markedly different patterns. In addition, any plausible explanation must satisfy the constraint of generating an early-life rise in acceleration and a late-life decline in acceleration, with the rise and fall being nearly linear in most cases. A refined explanation would also account for the minor peak in acceleration before age 40 for certain causes. 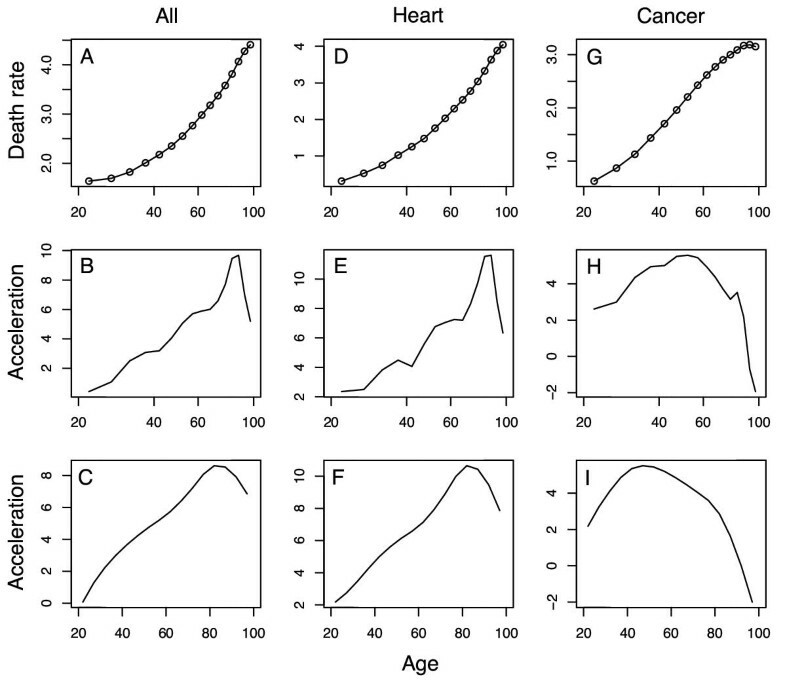 One point of this paper is to reiterate the puzzles revealed by the age-specific acceleration plots for different causes of mortality [2, 7]. The clarity of those patterns sets the stage for more focused work on this topic and for new hypotheses. Four attributes of the mortality patterns must be explained: early-life rise in acceleration, late-life decline in acceleration, a peak near 80 for some causes and a peak near 40–50 for other causes, and a minor peak near 40 for a few causes. If n stages remain before death, then the predicted slope of the log-log plot is n-1. In a paper on cancer incidence , I pointed out that as individuals age, they tend to progress through the early stages. If there are n stages remaining at birth, then later in life the typical individual will have progressed through some of the early stages, say a of those stages. Then, at that later age, there are n-a stages remaining and the slope of the log-log plot (acceleration) is n-a-1. As time continues, a rises and the acceleration declines. Gavrilov and Gavrilova  made roughly the same argument for the late-life decline in acceleration of human mortality. They argued that individuals at birth have redundant systems of protection against mortality, say n redundant systems. As one ages, some of those n systems fail, say a, fail. Then with n-a systems operating, the acceleration is n-1-a. Mathematically, this is essentially the same argument that I gave for cancer. However, I emphasized a multistage model of progression based on the idea that cancer develops in stages, partly driven by the accumulation over time of key somatic mutations in cell lineages. With regard to Gavrilov and Gavrilova's argument, it is not clear biologically what sort of redundancy exists in systems that protect against mortality. The multistage model can also explain the early-life increase in acceleration. Such increase occurs when the transition rate between stages increases slowly over time . In cancer, a slow clonal expansion of a precancerous population of cells increases the number of cells at risk for passage through the next stage of progression, and thus causes a slow increase in the acceleration of cancer incidence [9, 10]. Any slow rise in the transition rates between stages of progression will also cause a slow rise in acceleration. Figure 3 provides some numerical illustrations of how the multistage model may explain a midlife rise in acceleration and a late-life decline in acceleration. Predicted patterns of mortality from a multistage model. I calculated the curves based on the mathematical analyses and assumptions described in the Methods section (see Midlife rise in acceleration caused by increasing transition rates). The plots show that a multistage model can generate mortality patterns similar to those observed for various causes of death. There are not enough data on stages in disease progression to attempt a fit between observations and the model. Instead, the plots illustrate how various assumptions affect acceleration in a multistage model. I chose parameters for panels A and B to provide a rough match to the observations for heart disease in Figures 1D and 1F: the parameters are n = 4, u = 0.02, F = 20, a = 8.5, b = 1.5, T = 100, where n is the number of stages, u is the baseline transition rate between stages, F is the upper bound on transition rates, a and b set the shape of the function that determines how transition rates rise with age, and T is maximum age. I chose parameters for panels C and D to provide a rough match to the observations for cancer in Figures 1G and I: the parameters are n = 4, u = 0.012, F = 5, a = 5, b = 5, T = 100. I did not attempt to fine-tune the fit to the data; about ten trial and error choices for parameters gave the rough matches shown. The model is sufficiently flexible to generate a wide variety of shapes for different values of n. Therefore, the rough matches here mean little with regard to whether a multistage model is a good explanation for the observations. Tests of the model will require better understanding of stages in disease progression and rates of transition between stages. In the multistage model, the different acceleration peaks in heart disease and cancer may arise from different numbers of stages in progression or different transition rates between stages. The minor peak in acceleration early in life for male heart disease and a few other causes could be explained by heterogeneity in predisposition. Strongly predisposed individuals would go through the same multistage process, but with perhaps fewer steps to pass. That would cause the early-predisposition group to follow the same pattern of a rise and fall in acceleration, but to do so at an early age. That group would dominate the death statistics of early life, and thus would be seen as an early-life minor peak in acceleration. The multistage model is widely used in the analysis of cancer incidence and mortality [9, 10]. Could there be a different multistage progression for heart disease and other causes of death? Certainly, there are morphological and physiological stages of artery disease. First, depositions on the artery walls constrict blood flow. Second, various types of lesions may form, such as a fatty streak or fibrous plaque. Finally, lesion growth may trigger the initial stages of cardiovascular diseases. Andreassi et al. have argued that plaque formation may actually develop through a process of accumulating somatic mutations in cell lineages. Stages follow as mutations accumulate sequentially in those cell lineages, just as cancer may arise by mutations accumulating in the stem cell lineages that renew epithelial tissues. Multistage models can be tested by identifying the stages in progression and measuring how many stages healthy individuals have passed at different ages. Although the stages of cancer progression have not been fully worked out yet for any particular type of cancer, much research is focusing on this problem. Within a few years, we may know more about how particular somatic mutations affect progression. Then, with high-throughput genomics, one could screen cell lineages in healthy individuals to measure how individuals of different ages pass through the early stages of progression. Those data could then be linked to the acceleration patterns for disease at different ages. Similarly, better understanding of and diagnostics for cardiovascular disease progression will allow measurement of early stage progression in individuals of different ages. Again, those measurements of progression could be used to test particular models for the acceleration of mortality at different stages in life. The acceleration plots for the leading causes of death show several striking patterns that must be explained by any theory of aging and mortality [2, 7]. The late-life decline in mortality acceleration has been widely discussed. However, the analyses here demonstrate different patterns of midlife rise and late-life decline in acceleration for different causes of death. These analyses also put the late-life decline in a broader context by emphasizing various universal and particular features of mortality acceleration at different ages and across the different major causes of death. I developed a multistage model of disease progression that can explain the observed patterns of mortality acceleration. An early-life rise in acceleration may be caused by increasing rates of transition between stages as individuals grow older. The late-life decline in acceleration may be caused by progression through earlier stages, leaving only a few stages remaining for older individuals. where i = 1,...,n-1, x j (t) is the frequency of individuals born at time 0 that are in stage j at time t, u j (t) is the rate at which individuals move from stage j to stage j+1, d j (t) is the death rate from other causes for individuals in stage j, and the dot is the derivative with respect to age. An individual dies when it arrives in the nth stage, thus x n (t) is the cumulative probability that an individual dies from the final stage of disease progression between ages 0 and t. The probability interpretation arises by letting x 0(0) = 1, x k (0) = 0 for k = 1,...,n, and accumulating deaths by other causes in a class, with D(0) = 0. The cumulative probability of death from the final stage of a particular disease from age 0 to age t is x n (t). The rate of change in the cumulative probability of death at age t is , which is the probability of death per year at age t. (Here, t is continuous, and is the probability density at the point t.) Data on death are often presented as age-specific incidence, which is the probability of death per year at age t from a particular disease divided by the probability of surviving to age t. In the notation here, the age-specific incidence is , where survival is . The age-specific incidence has dimensions 1/t. Age-specific acceleration is the derivative of age-specific incidence, dI(t)/dt, which has dimensions 1/t 2. The right side is the change in x divided by x, which measures the fractional change in x independently of how large or small x is. The previous section showed that dI(t)/dt is the age-specific acceleration, so LLA is just a normalized (nondimensional) measure of age-specific acceleration. The simplest models assume that the u j values do not change with age . If nearly all members of a cohort at birth (age 0) concentrate in stage 0, then newborns mostly have n steps remaining. Later, as long as most of the probability among those alive remains concentrated in stage 0, the cumulative probability of death is x n (t) ≈ U t n , where U depends on the various constant transition rates, u j (see below). , and so I(t) = Unt n-1/S(t). Taking the logarithm of both sides yields log(I) ≈ log(Un) + (n-1)log(t) - log(S(t)). Thus, with constant transition rates, the log-log plot of age-specific incidence is approximately linear with age and has a slope of n-1. This can be seen from the log-log acceleration, which is d log (I)/d log(t) ≈ n-1, as long as the total number of surviving individuals, S(t), does not change too fast. To sum up so far, with the simple model of constant transition rates between stages, the standard approximation for the multistage model that has been applied to cancer  yields a constant log-log acceleration of n-1 that is independent of age. The standard approximation is not a proper analysis – the point here is to show how one might conclude that a multistage model with n steps yields a log-log plot of incidence versus age that is linear with a slope of n-1. I pointed out that as individuals age, they are no longer concentrated mostly in stage 0 . If at age t, most individuals had passed to stage a, then the log-log acceleration at age t would be n-a-1. The actual acceleration at age t depends on the distribution of individuals over stages at that age, that is, the values of the x i (t). As individuals grow older, they move through the early stages and become concentrated in the later stages. This causes acceleration to decline with age . Among old individuals, most will have only one or few stages remaining, and the acceleration drops toward zero. The analysis of acceleration in this section assumes that the transition rates, u j (t), do not change with time. Below, I consider the case in which the u j rise with time, causing acceleration to rise with age over the middle years of life . If the transitions rates are constant and equal, u j = u for all j, and the nonspecific death rates are constant and equal, d j = d for all j, then we can obtain an explicit solution for the multistage model. This provides a special case that helps to interpret more complex assumptions that must be evaluated numerically. The solution is x i (t) = e -(u+d)t (ut) i /i! for i = 0,...,n-1, with the initial condition that x 0(0) = 1 and x i (0) = 0 for i > 0. If transition rates between steps vary, all steps influence acceleration early in life, whereas the slowest steps dominate the number of remaining steps and the acceleration later in life. If the transition rates, u, rise with age, then many older individuals will have passed through the early stages, causing a strong decline in acceleration later in life. An increase in transition rates, u j (t), with advancing age causes a midlife rise in acceleration. And, as mentioned in the preceding paragraph, faster transitions move more older individuals into later stages, causing a late-life decline in acceleration. 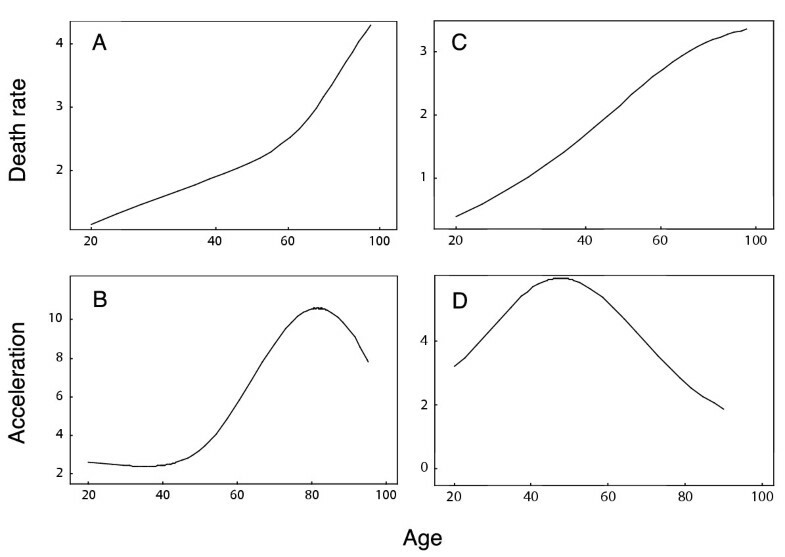 where T is maximum age so that t/T varies over the interval [0,1], and the parameters a and b control the shape of the curve. We need f to vary over [1,F], where the lower bound arises when f has no effect, and F sets the upper bound. So, let f(t) = 1+(F-1)β(t). See Figure 3 for an example. Previous work on aging has studied acceleration in mortality by using the lifetable aging rate measure [2, 7, 15, 16]. The classical measure of mortality rate in the standard lifetable is m(x), the rate of death at age x. Although m(x) is usually calculated from data, it has roughly the same meaning as I(t) in the multistage analysis above. This measure analyzes scale-free changes in mortality relative to scale-specific changes in age. For example, one may wish to know by what percentage mortality changes in a particular year of life. By contrast, log-log acceleration measures percentage change in mortality relative to percentage change in age. Both measures provide a picture of mortality acceleration. If one does not have an underlying model of the processes that influence aging, then the LAR measure provides a reasonable approach because it arises from analysis of the statistics of life and death at particular ages. In the context of a multistage model of the aging process, the log-log acceleration gives a weighted measure of the number of stages remaining at a particular age. Extensions to the multistage model can also be incorporated – for example, changes in the transition rates, as mentioned above. Also, to the extent that aging rates change exponentially with age, logarithmic scaling of age may provide a more natural measure. National Science Foundation grant DEB-0089741 and National Institutes of Health grant AI24424 support my research. SAF conducted all the work on this manuscript.